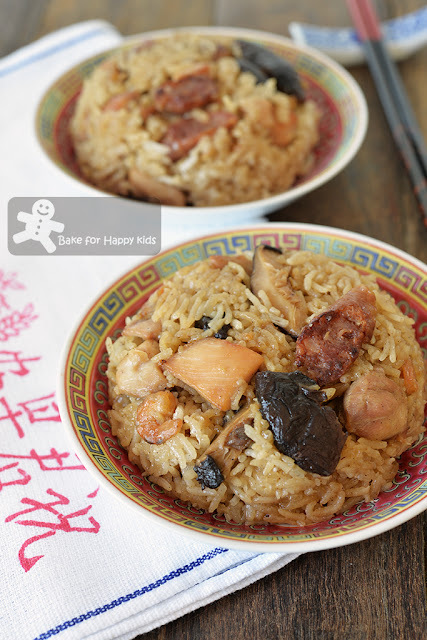 Bake for Happy Kids: Quick and Easy Lo Mai Gai / Chinese Chicken Glutinous Rice - One Pot Rice Cooker Method and Easy to Digest! Quick and Easy Lo Mai Gai / Chinese Chicken Glutinous Rice - One Pot Rice Cooker Method and Easy to Digest! "I need to buy 250g chicken." I said. "I need only 250g chicken!" I said with a reaffirming voice. "What are you cooking tomorrow?" asked my husband who obviously wants to eat more chicken too. "Lo mai gai" I said. "What lo mai gai?" asked my clueless Australian-born son. 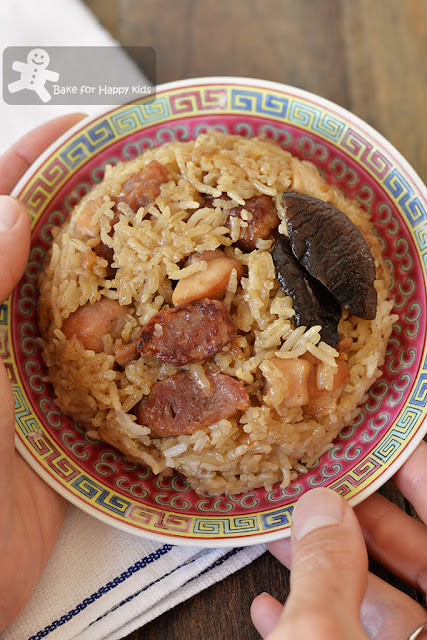 "Lo mai gai is 糯米鸡 in Chinese and is translated as glutinous rice with chicken." I replied. "I don't want to eat glutinous rice!!! It is so difficult to digest!" Once again, our glutinous-rice-hating old man is addressing his issue with glutinous rice. LOL! "I know. This is why I have formulated a recipe that can cook lo mai gai easily and also easy to digest!" I said. "I like glutinous rice! Mummy, can you please please please cook lo mai gai?" Some recipes require cooking the glutinous rice first, then steam the rice after assembling the cooked rice with chicken and other ingredients. The advantage of these recipes is that the rice will cook faster resulting the rice to be moister and more digestible than steaming it from scratch. However, the disadvantage is that the chicken flavour won't be well infused into the rice because the rice has been pre-cooked before steaming it with the chicken. Therefore, other recipes assemble all ingredients including the rice into portions and steam for 30 mins or more until the rice is thoroughly cooked. Knowing that steaming glutinous rice will take a longer time to cook than regular white rice and steamed glutinous rice can be difficult to digest for our old man, I have to rule out this method of cooking lo mai gai. Introducing my one-pot rice-cooker way of cooking lo mai gai... It's easy. All I need to do is to 1) season the rice 2) sauté the chicken and other ingredients 3) assemble all in rice cooker or a non-stick cooking pot 4) cook! 5) And enjoy!!! 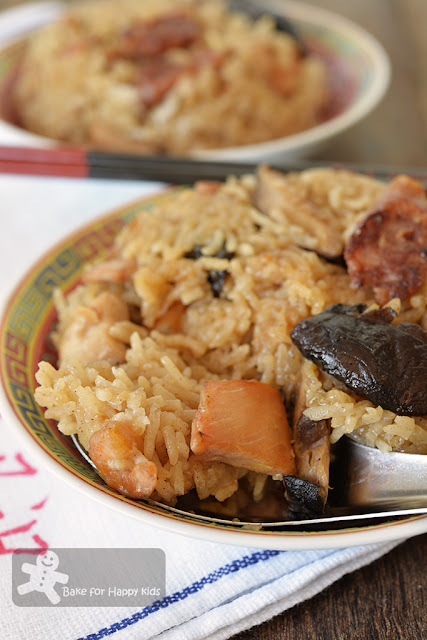 If you prefer the dark style of lo mai gai like ours, you can add soy sauce to season your rice and chicken. If you prefer the "white" and basic loh mai gai with chicken only like the ones that selling at Singapore kopitiam, you can substitute soy sauce with salt and omit the addition of mushroom and lap cheong. And of course, if you want to cook ha mai lo mai gai meaning glutinous rice with shrimps and chicken, you can incorporate dried shrimps into your lo mai gai like ours. However, if you want your lo mai gai to be wrapped in lotus leaves like the ones selling in Cantonese yum cha / dim sum restaurants, I'm sorry that my one-pot method can't do all in just one pot! To do so, you will have to cook the lo mai gai in the rice cooker first, wrap the cooked rice in the leaf and steam the rice again! What a hassle, hor? Is glutinous rice too indigestible for you? I have learned from my blogging / Instagram friend, Bee @honeybeesweets.sg that the use of basmati rice and glutinous rice in 1:1 ratio can cook glutinous rice that is still sticky and yummy and yet so much easy to digest afterwards. Yup! Absolutely no complains at all from the our old man after he ate the rice. Although my husband didn't say anything about the rice, I can tell that he actually enjoy eating my home-cooked lo mai gai!!! LOL! Proudly presenting my quick and easy way of cooking lo mai gai! Sticky, tasty and easy to digest!!! Want to cook this easy lo mai gai for your family? Here's a video showing you how I cooked mine. *To aid digestion, I have used 100g basmati rice and 100g glutinous rice instead of all glutinous rice. ** Substitute every tbsp soy sauce with 1/2 tsp salt or more to taste if you prefer your lo mai gai to be the "white" and basic kind. *** Will require 1 1/2 cup (375ml) water if you use a sieve to drain the soaked rice thoroughly instead of just pouring off all excess water. **** Optional if you prefer your lo mai gai to be made with just chicken. If you omit lap cheong, you will have to use 1 tbsp cooking oil to sauté the chicken. Wash and drain the soaked rice (both rice if you are using basmati rice) thoroughly by pouring off any excess water (see the above ***). Add sesame oil, light soy sauce, fish sauce, sugar, five-spice powder and water into the drained rice. Set aside. Heat a large frying pan or a work over medium heat. Cook lap cheong over the high heat for about 1-2 mins or until the fat from the sausages is released and the edges are crispy. Remove lap cheong from the heat. Set aside. Increase heat to medium high. With the sausage-oil remaining in the heated pan or wok, sauté chicken for about 3 mins or until they are nicely browned. Add mushrooms and shrimps and continue to cook for about 1 min or until they are fragrant. The chicken don't have to be cooked thoroughly as these ingredients will be cooked with the rice later. Remove from heat and set aside. Place chicken, mushrooms, shrimps and lap cheong into the pot of your rice cooker or a large non-stick cooking pot that a well-fitted transparent lid if you don't have a rice cooker. Place rice including all its liquid on top of the chicken and use the rice cooker (preferably with glutinous rice function) or a cooking pot with simmering low heat to cook without opening the lid until all of the liquid has been absorbed. Turn off heat and allow the rice to rest for at least 15 min without opening the lid. NO peeking!!! Serve while the rice is warm. Store any uneaten rice in an airtight container in the fridge for up to 2 days. Please do not keep lo mai gai in freezer if you are cooking yours with basmati rice because cooked basmati rice is not suitable for freezing. Heat it in the microwave or steam it for about 5 mins until it is warm again before consuming it.